Every quilt is an Adventure and leads the way to the next quilt. Hear the behind the scenes tales of 49 Pieces of Chocolat and the Sewing Room Vortex; Bob’s Quilt a Six Year Saga; Twilight in the Bronx and the Case of the Seam Ripper. Please contact me: terificreations at gmail dot com. This is entirely up to you, and includes piecing, and quilting. Minimum 2 hours, not including travel time. A retreat is a time of refreshment, direction, and renewal. A time to grow, explore, and discover more of who we are as quilt makers. The retreat can be directed making a quilt in my style (Twilight in the Bronx, or Moon Over Manhattan) or something you’ve wanted to work on in a focused way. A focus on thread, batting, and color; how they work together to create, and You develop our own personal style in a quilt. You can free-motion quilting on your home sewing machine. It’s easy when you know the tricks and tips that the “pros” use. We will learn to pair thread weight and needle size, when to adjust tension, and how shoving a queen size quilt into a 6” harp. This class covers the basics: stitch in the ditch, thread burying, straight lines and curves, moving right through to feathers. Join the machine quilting club! Doodling is a great way to figure out and practice quilting motifs. 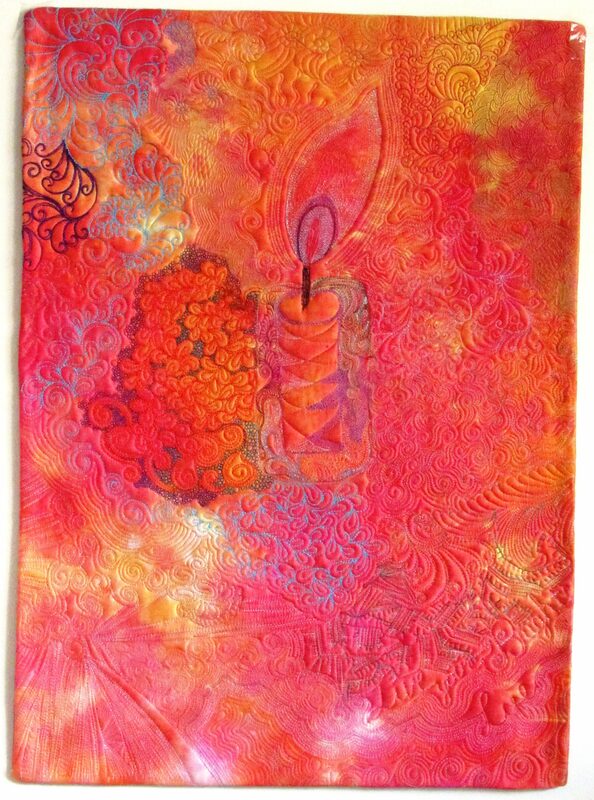 We use printed quilt blocks to doodle and practice feathers, swirls, arcs, and more. We will draw with both our dominant and non-dominant hands for understanding the motion of each motif. Doodling is a great way to come up with a quilting plan. Full Day part of the day on sewing machines – kits available. A color wheel is one of the best tools we can use in quilting however it can feel a bit overwhelming so let’s break it down to the basics focusing on color neighborhoods (next-door, across the street). We will embrace the color we love, and learn how to use it well in our machine quilting. We will explore thread weight and the difference between open and dense stitching. Stippling and stitch in the ditch are machine quilting go-to’s with good reason. Let’s let our foot loose and explore fun free-motion stitching. We will play with design, thread, fabric and batting to create some fun, one-of -a-kind quilts. This class focuses on trying new-to-us motifs, using our imagination and going for it with machine quilting on a domestic sewing machine.